Coconut Grove is the oldest neighborhood in Miami. The landing post for many American and foreign settlers looking for the promise of free land, Coconut Grove is full of character. Known as an enclave for artists, free-spirited souls and colorful personalities, Coconut Grove is one of the most coveted neighborhoods in Miami. It's evolved to be an eclectic and affluent neighborhood attracting residents from all over the world and some of Miami's most successful entrepreneurs. It's a tropical heaven, with peacocks peacefully roaming its streets and homes romantically tucked in behind luscious oaks and exotic plants. In Coconut Grove no street is ever the same. Nowadays, cozy bungalows are been torn down to make way for modern and minimalist mansions with starting prices in the $2M. The "Grove", as it's called by locals, is divided in two sections: the North Grove, closer to the Bay/Downtown area, and the South Grove which borders Coral Gables. Coconut Grove primarily features single family homes, and a few small exclusive gated communities that are both, private and understated. The heart of the Grove (Main Highway) is undergoing a transformation, and some of the newest most daring local chefs are opening restaurants in the area along exclusive shops and boutiques. The area bordering the bay will soon feature the most exclusive and luxurious condos the neighborhood has seen in decades (The Governor's House and Grove Park). The lush and tropical landscape, it's meandering and cozy streets. The colorful locals. This is a very interesting, irreverent and eclectic neighborhood. It's experiencing a revival and a transformation. 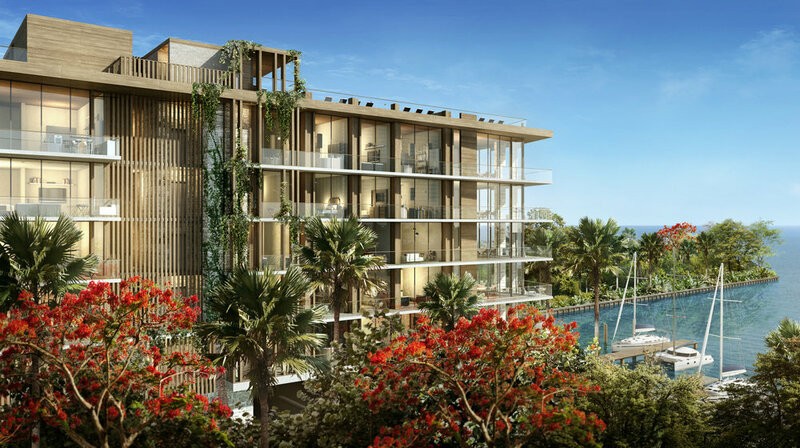 This is a boutique collection of twenty-six new and exceptional waterfront residences with direct access to Biscayne Bay, and with sublime indoor and outdoor amenities. Secluded, private and green. Generous layouts that bring the outdoors indoors. From $1.4million ( 2- 4 bedrooms). To get inspired watch this video. Much talked about waterfront luxury condo development consisting of three residential towers with 284 residences. A Terra and Related development designed and lead by OMA and Rem Koolhaas, with interiors by Meyer Davis. Two of the three towers are almost sold out. Estimated completion date late 2017. Prices starting at $4M for a three bedroom pad. I never want to miss the weekly Coconut Grove's Farmer's Market on Grand Avenue. It is filled with the freshest local produce and the most delicious and creatively prepared food (think all vegan, raw recipes, freshest ingredients full of flavor). Must order a seaweed roll (prepared on the spot), sip on some fresh coconut water and finish the meal with a bite of raw all vegan fruit pie. This is one of the most legitimate farmer's markets in town. Great spot to people watch too. Peacock Park: Ideal place to do a picnic, practice some soccer or enjoy a weekend stroll. If you have kids the playground area has been recently renovated and it's fun. My favorite neighborhood lunch spot: The Last Carrot (3133 Grand Avenue, right next to Subway). Fresh, crunchy and delicious pita sandwiches, smoothies and salads (can't miss their sauces). No frills, totally kitschy and surprisingly cheap, with vegetarian options). Best hidden secret: Who knew that some of the best Thai Food in Miami can be found at a convenience store? Check out some delicious and authentic dishes @ the Asia Thai counter inside the Kwik Stop Convenience store on Grand Avenue. Best Spot Overall: Whether you are looking for a great book, need a spot for peace and quite or are looking for a delicious lunch/brunch or quick bite, this spot is a must. I keep going back for more! It is a wonderful bookstore, and the counter/cafe offers not to be missed fresh and creative dishes (I love their Bowls!). In true Grove fashion, a lot of their dishes are healthy, organic and locally sourced with a nice vegetarian selection. It's a hassle to find cheap parking near it, but it's worth it. Best outdoor dining setting: Glass & Vine. The romantic setting with ample seating and a luscious canopy of greenery is impossible to resist. It also makes the perfect brunch spot for families, as you can dine while the kiddos play in the playground behind the restaurant (tip: make sure you book a table ahead of time and ask to be in front of the playground). My restaurant picks - A must try! Bombay Darbar is certainly the best Indian restaurant in Miami and it's randomly located on side street off CocoWalk (2901 Florida Avenue, must book ahead!). Ladies who lunch can be found at Strada in the Grove. Classic Italian fare, consistent and happening always. Peacock Cafe has nice ambiance and a spot good for events (baby shower, wedding shower, you name it). Best Burgers at The Lokal - (a good option if you want to avoid the always packed Green Street Cafe). A secret guilty pleasure: Flannigan's. An institution. Bar fare, plenty of action and loud crowds. Who doesn't love loaded nachos and a pitcher of chill draft beer. Crowd pleaser: Jaguar. Sort of what Hillstones is to the Coral Gables neighborhood - you know it's been there forever, there's always a crowd and you know exactly what to order (the same thing you always order).